I like ladybugs and I have made a couple of ladybug bentos previously which can be seen HERE, and by coincidence they were also packed in our Easylunchboxes containers. In this one, I used a circle cutter to shape the sandwich and also the mild cheddar cheese which I further trimmed by making a "v" cut to make the wings, and though I did the trimming for the head by freehand, a circle cutter could be used there also. The sandwiches were completed by using small circle cutters for the wing spots and for the Havarti cheese eyes. A similar design was used for the Babybel cheese by trimming the red wax coating using my smallest circle cutter for the dots and food safe marker for the eyes. 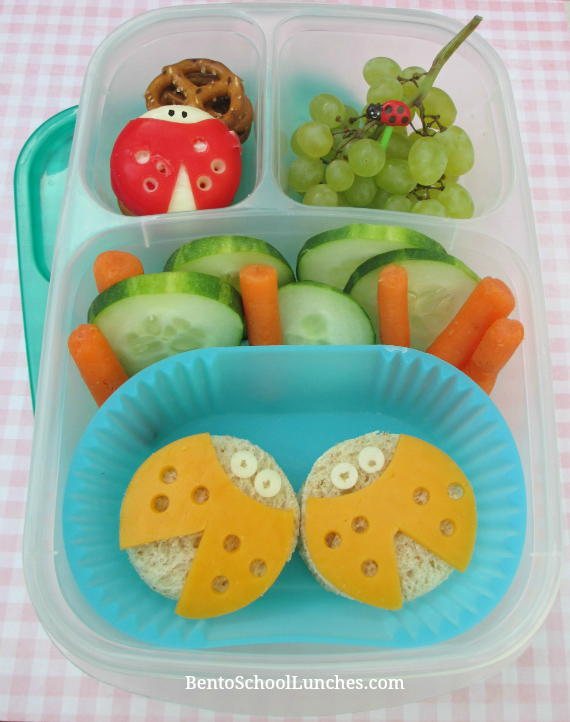 Ladybug design sandwiches, cucumber slices and organic baby carrots. Babybel cheese in ladybug design with mini pretzels. Small green grapes with a ladybug pick. So adorable! I especially love the ladybug pick on top of the grapes, very cute! Thank you so much Jean. :) The pick is one of my favorites! Thank you for linking up at Fun Food Friday!